I’ve been involved in a work project the past four days that has kept me tired and covered in sawdust. Neither is terribly conducive to blogging. I did get one post sort of written, but it stalled. So here I am, churning out a random post. Well, not entirely random I suppose. In fact generating a post by random would just yield gibberish in virtually all cases. No, these are the disjointed and tired thoughts of an aging hominid on the surface of an unremarkable planet orbiting an unremarkable star. OK, mostly gibberish. Well, Romney looks like he’s going down in flames. He can’t even make a joke anymore without getting pilloried. He does seem to have a way of putting his foot in his mouth. I’m back to my original 2012 election analysis of some time ago, The Repubs will field a weak candidate because no one in their right mind wants to take on Obama. And the Repubs are also paying for four years of obstructionism; I mean, for four years, if Obama did it, they were agin it. Their programmed core voters of course all know Obama is a socialist who is destroying the country, the same way Liberal core voters think Obama is some sort of liberal humanitarian, but to win the election the Republicans needed to appeal to middle of the road voters and just in general people who don’t strongly identify with either party. And not only have the Repubs failed to do this, they seem to have gone out of their way to alienate a number of demographics. Right now I’m calling the election for Obama. In science news, scientists have been studying how slime mould might take over the world. Helpful illustration above. 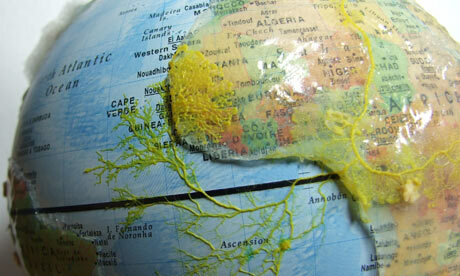 Yes, scientists really did cover a globe with agar and corn flakes to see how a slime mould would spread. For those unfamiliar with slime mould, it’s a mould that grows branches in search of food. Is there any practical use for this research, or are scientists just wasting money? Of course there is! People who think scientists should study useful things are idiots. Idiots in the sense that their opinion shows they know dipsquat about science. There’s nothing stupider than someone who holds an opinion about something they are ignorant about. Why is it idiocy? Because there’s simply no way to tell in advance what research may lead to useful advances. In this case scientists are interested in slime mould’s pathfinding ability, and this research someday might contribute to designing transportation systems. That’s a pretty practical application from growing mould on a globe. Speaking of the global scene, the chances of war have gone down, though it’s still ugly. And it’s already war, so I mean a bigger war. It is fascinating to me how we have drifted from being more or less at peace to being in constant war. In the eighties if a US serviceman died overseas, it was front page news. Now they die all the time and no one cares. (Political posturing doesn’t count.) Syria is in full armed insurrection. It’s not really a civil war, but the media’s use of war terminology is muddy at best. Ahmadinejad showed that his international diplomacy skills are on par with Romney’s. A lot of what he says makes perfect sense, but if he’d leave out the egregious insults to Israel and Jews he’d make a lot more headway on the world scene. His term is almost up, that should be interesting. Afghanistan: We’ve surrendered to the Taliban, but aren’t going to admit it until after the election. IE all joint training and exercises with the Afghan army have been halted. It’s over folks. BS aside, world drought and climate changes are the elephants in the room. My contacts in the Midwest say they’ve never seen anything like it before. There’s been serious global drought issues for a number of years now, and it may get worse. Arctic ice is at unprecedented lows this fall as well. World wide bacon shortage unavoidable at this point. Some sort of secret plot of Obama’s no doubt. I think humanity may survive, but the global civilization we have built has foundations of sand. And a Wind is Rising.